AMY GOODMAN: This is Democracy Now!, democracynow.org, The War and Peace Report. I’m Amy Goodman. We return to MIT professor Noam Chomsky. Democracy Now!’s Juan González and I spoke to him on Tuesday. JUAN GONZÁLEZ: I wanted to ask you about Latin America. We had a period, for about 10 years, of enormous social progress in Latin America—all these socially minded governments, reduction of income inequality, the only part of the world where there are no nuclear weapons. And yet, now we’ve seen, in the last few years, real steps backwards. Quite a few of the popular governments, with the exception of Ecuador, recently have been thrown out of office, and a deepening crisis in Venezuela. Your sense of what has happened, in that, after so much promise, all of a sudden it seems that the region is going backward? 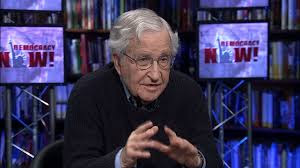 NOAM CHOMSKY: Well, there were—there were real achievements. But the left governments failed to use the opportunity available to them to try to create sustainable, viable economies. Almost every one—Venezuela, Brazil, others, Argentina—relied on the rise in commodity prices, which is a temporary phenomenon. Commodity prices did rise, mainly because of the growth of China. So there was a rise in the oil price, of soy, and so on and so forth. And instead of trying to develop a sustainable economy with manufacturing, agriculture and so on—like Venezuela is potentially a rich agricultural country, but they didn’t develop it—they simply relied on the commodity—raw materials commodities they could export. That’s a very harmful—it’s not only not a successful, it’s a harmful development model, because when you export grain to China, let’s say, they export manufacturing goods to you, and that undermines your manufacturing industries. And that’s pretty much what’s been happening. On top of that, there was just enormous corruption. It’s just—it’s painful to see the Workers’ Party in Brazil, which did carry out significant measures, just—they just couldn’t keep their hands out of the till. They joined the extremely corrupt elite, which is robbing all the time, and took part in it, as well, and discredited themselves. And there’s a reaction. I don’t think the game is over by any means. There were real successes achieved, and I think a lot of those will be sustained. But there is a regression. They’ll have to pick up again with, one hopes, more honest forces that won’t be—that will, first of all, recognize the need to develop the economy in a way which has a solid foundation, not just based on raw material exports, and, secondly, honest enough to carry out decent programs without robbing the public at the same time. AMY GOODMAN: What about Venezuela? NOAM CHOMSKY: Venezuela is really a disaster situation. The economy relies on oil as to a great—probably a greater extent than ever in the past, certainly very high. And the corruption, the robbery and so on, has been extreme, under the—especially after Chávez’s death. So, it’s a—I mean, if you look at it, it still has—if you look at, say, the U.N. Human Development Index, Venezuela still ranks, say, above Brazil. So it’s the—there are hopes and possibilities for reconstruction and development. But the promise of the earlier years has been significantly lost. (*) Chomsky is a world-renowned political dissident, linguist and author. He is institute professor emeritus at Massachusetts Institute of Technology (MIT), where he has taught for more than 50 years. His new book comes out today, titled Requiem for the American Dream: The 10 Principles of Concentration of Wealth & Power.